Wholesale Personalized Christmas Carols Book. Inexpensive, Promotional, Best in America. Bulk custom imprinted Christmas Carols Book with illustrations, musical notes and words (lyrics). 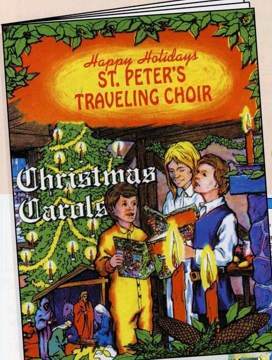 This is a bargain-priced song book which has full color illustrations that accompany the words and music for your favorite carols. It is a family book for a song-filled Christmas season. Best price in USA, Canada for bulk personalized Christmas Carols Book. Size: 8" x 10 5/8"